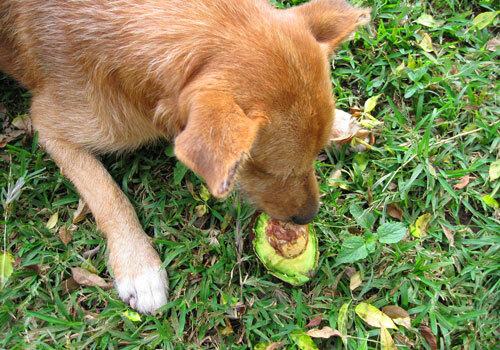 Can Dogs Eat Avocado: A Healthy Fruit or Is It Poisonous to Dogs? We love the tasty fruit of the avocado tree in many shapes and sizes – on toast, in salad, or mashed in a tasty guacamole. But as we’re sitting on the table enjoying the delicious tasty treat, we see our dog staring at us with big sad eyes. 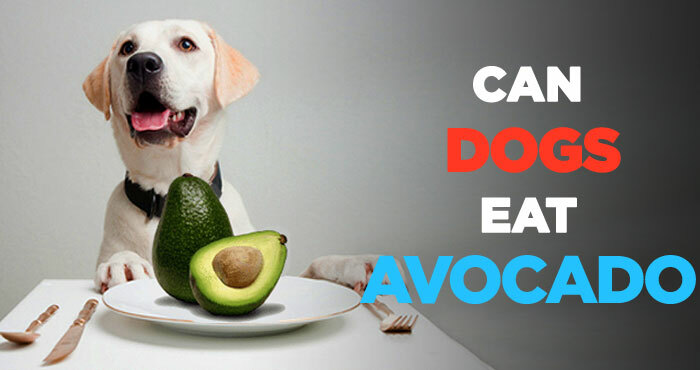 That’s when we’re most likely to ask ourselves the question: can dogs eat avocado? Unfortunately, the answer isn’t as black and white as we want it to be. Many dog experts are in dispute about whether avocado is good for dogs because it’s actually very poisonous to other animals! So are dogs in this group or not? As with people, all dogs are different when it comes to the foods they tolerate. 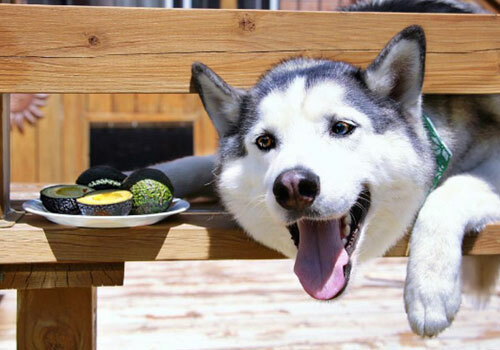 You can feed your dog avocados if you want, as long as you exercise enough caution! What’s good about avocados? What’s bad about avocados? How to feed them to your dog? So many questions, all to be answered if you keep reading! Read on to find out all the answers you need and leave a comment if you found this post helpful! Just like with humans, avocados can have many nutritional benefits for your dog! First of all, when dogs eat avocado, they benefit from the tasty fruit being really rich in potassium. They contain more than 60% potassium when compared to bananas. Potassium is really good for keeping a healthy, shiny coat on your pooch and for their general wellbeing. Useful ingredients like dietary fiber and natural fats and essential omega fatty acids are another reason why providing avocado for dogs makes so much sense. Normally, it’s very hard to find natural foods that contain just the right amount of fat – fortunately, avocado hits that perfect balance! The avocado fruit is rich in a lot of very useful ingredients. Those include, but are not limited to, vitamin A, vitamin C, vitamin E, folate, and niacin. All these useful ingredients help with your dog’s immune system and are extremely useful nutrients that most mass-produced dog food might not contain. Last but not least, avocado is perhaps one of the best sources of protein – that’s why human vegetarians love it so much! It contains 18 amino acids, which is higher than most, if not all other fruit, and it contains most of the protein found in meat. Naturally, your dog is an omnivore, so avocado can’t be a replacement for meat in their diet, but avocados are a great, healthy way to make sure they get more protein. Protein is extremely healthy and necessary for your dog’s development. It’s necessary to ensure there are no issues in your pooch’s muscle growth and internal organ development. After all this information, you may be tempted to go out to the nearest shop right now and buy avocados for your dog immediately. But every story has two sides, and you need to consider the possible ways in which avocados can be harmful to your dog too! Everything is on a case-to-case basis, and you should always consider the possible risks before introducing new food to your dog’s diet. The main controversy surrounding dogs and avocado comes from the fact that avocado is actually toxic to a lot of other animals like guinea pigs, birds, rabbits, and large cattle. That’s because avocado contains a fungicidal toxin called persin. This chemical is toxic to a lot of animals and causes severe allergic reactions in others, however, recent studies have shown that it’s completely harmless for dogs. Furthermore, pepsin is only found in large quantities in the avocado’s pit, peel, bark, and leaves – all elements of the avocado fruit that you should never feed your dog. 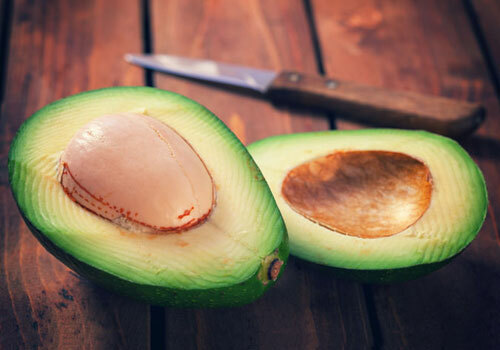 It’s not actually found in the avocado’s meaty parts – which is the part we eat – so even if your dog is allergic to the chemical itself, they will be safe eating the meat of the avocado. Raw avocado for dogs is good and can bring all its health benefits, as long as it’s not consumed whole. If your dog’s anything like mine, they’ll try to eat anything that falls within their line of sight, preferably whole. 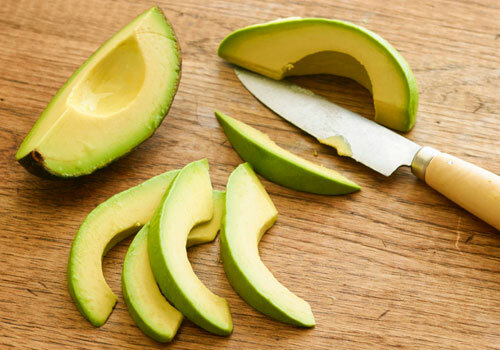 Always clean the avocado of the peel and pit before feeding it to your dog. Not only do those elements of the avocado contain too much pepsin but they also present a serious choking hazard. A good rule of thumb is to think how you yourself eat avocado. If you wouldn’t eat any element of it – then don’t give it to your dog. It’s that simple. Another risk avocados can pose is the potential for different fungal, bacterial and viral diseases. It’s normally very easy to tell when the avocado is off. It develops strange spot on its skin and flesh, the outer peel becomes dark green, or the fleshy body is very light green or brown. 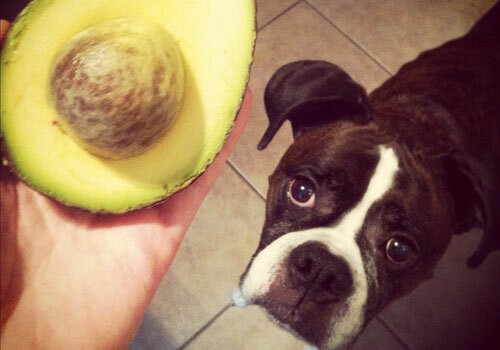 Avoid giving avocados like this to your dog – and, in fact, avoid eating them yourself. Finally, remember that all dogs are different. 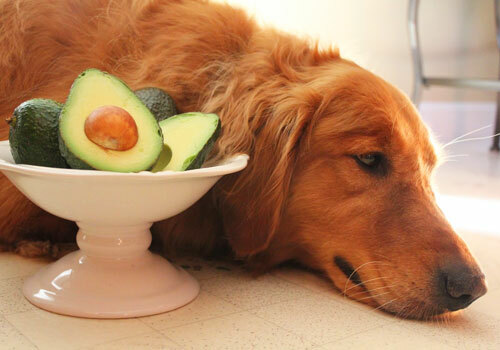 If you’re introducing avocado to their diet, observe your dog’s reaction closely. Are they behaving in a strange way? Do they have loose stool? Are they throwing up, or refusing to eat? If that happens, stop giving the avocado immediately and consult a vet. How To Prepare Avocado For Dogs? As we’ve already mentioned before, think about what bits of the avocado you would eat yourself – that’s what your dog needs to eat as well. Always remove the pit, the peel, bark and leaves (if any). It’s vitally important that you take out the pit before feeding avocado to your dog. Avocado pits are very round and heavy, and they are also completely massive. They really are bigger than most fruits’ and therefore, they present a serious choking hazard! If a small pit of a cherry can be at risk of blocking your pooch’s digestive system, imagine what a pit at least four times that size can do. It can block your dog’s esophagus, intestinal tract or stomach, which can be a life-threatening condition! As for the peel, you should pretty much remove it for the same reason. It’s very hard and scratchy, so it will most definitely cause your dog an upset stomach. More importantly, the avocado peel has no added health benefits for your dog, so there’s really no reason to risk giving it to them! Finally, like we mentioned before, while most dogs take well to avocado, yours might not. Dogs – much like humans – can develop unforeseen allergies, and you might not be aware of all of them. If you notice an allergic reaction after feeding avocado, then avocados probably aren’t a good choice for you. Don’t worry, though, they’re not in any way essential, and there’s a lot of other healthy, tasty snacks available for your dog. My Dog Ate Avocado! What Should I Do? Avocado for dogs is only good in moderation because in case of overconsumption the increased amount of fats and protein will make them sick. One avocado every two weeks is a perfectly reasonable amount to feed your pooch, any more than that and you’re running the risk of making them sick. What to do if you come home and find your pooch has gorged on several avocados? It depends on what part of the avocado your dog’s eaten. If they’ve ingested a pit, make sure to get them to the nearest vet as soon as possible. Pits need to be taken care of as an urgent medical problem, as they might lead to very serious consequences. If by some coincidence your dog’s avoided the pit, still make sure to observe them closely and not feed them any more avocado. The peel might cause a stomach fuss, so observe for any signs of difficulty breathing, loose stool, gas, and vomiting. Overall, there’re not many dangers associated with overeating on avocado, however still be cautious and monitor them closely. Dog and avocado work well together only when they don’t meet each other that often. All that dog and avocado information making your brain turn into guacamole? Don’t worry for another moment because the cheat sheet is coming. 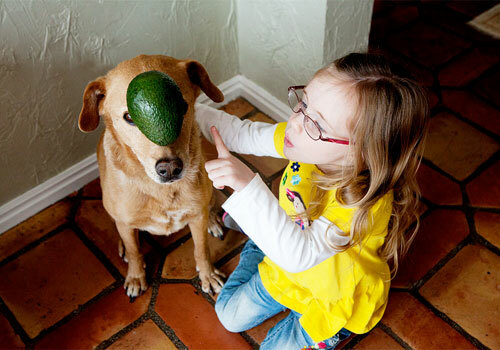 We’ve devised a handy Q&A for all questions relating to dogs and avocados. Remember, if you can think of any other questions, pop them in the comments below! 1. Can dogs have avocado? Are avocados good for dogs to eat? While this is a highly controversial topic among dog health bloggers, the answers is generally yes. 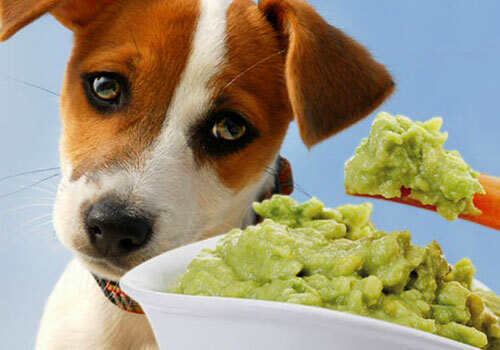 Avocado is very rich in natural fats, proteins, and vitamins, all things that are good for dogs. Also, the claim that pepsin, found in avocado, is harmful to dogs has been refuted, so avocado is officially safe and okay to feed to your pooch. 2. Can dogs eat avocado pits? Are avocado seeds edible? That’s definitely one part of the avocado you should avoid giving to your dog at all costs. Avocado pits don’t contain any of the avocado’s natural nutrients, but they’re also very big in size and pose a considerable choking hazard. In the same way that we don’t eat the avocado pits, don’t give them to your dog because they’re nearly impossible to digest. 3. Are avocado seed poisonous? Are avocado pit toxic? Pits are the main source of avocado toxicity as they contain very high levels of persin. While it’s okay to consume in small quantities, persin is toxic when it’s in high concentration like it’s in the pit. Avoid giving this to your dog at all costs! And, subsequently, avoid eating it yourself too, as the toxicity of pepsin isn’t only harmful to dogs but to their owners as well! 4. Is avocado skin edible? What about avocado oil for dogs? The skin’s grainy, hard texture can cause an upset stomach, so make sure you remove all parts of the skin before giving it to your dog. On the other hand, a lot of commercial dog foods on the market contain avocado oil. That’s a completely harmless extract since it doesn’t have any of the pit or the skin in it, so it’s harmless to dogs. 5. How much avocado can a dog eat without getting sick? And how often? There isn’t a strict set of rules to follow but if you’re really keen on giving avocado to your dog then one avocado every two weeks is a perfectly sensible amount. 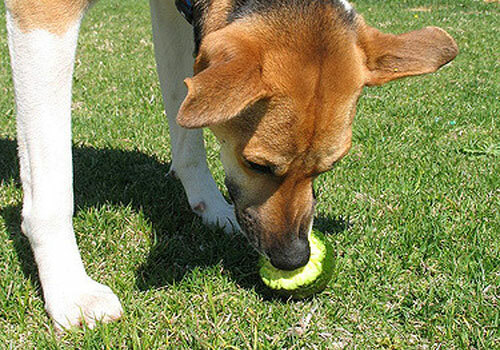 If your pooch likes it a lot, you can give them smaller pieces more often. Avoid going overboard, as the fats in avocado can lead to your pooch gaining some unwanted weight. 6. Are dogs allergic to avocado? Just like humans, dogs have all sorts of different allergies. Like with any new fruit, start gradually and if you see any change in your dog’s eating patterns, breathing, or stool, then contact your vet immediately. Some dogs may be allergic to the traces of persin in the avocado’s flesh, so observation is key in the first few days of avocado munching. 7. Can puppies eat avocado? All puppies under six months of age should stick to their strictly prescribed puppy food. So it’s a big NO for them. For puppies over that age, it’s still not recommended because they have a habit of gorging on everything and, as we established, too much avocado isn’t very good for them. You can try giving them a lot less than you would give an adult, just to gauge how they’re taking to it. Generally, though, always keep puppies on their vet-prescribed food. So what’s our final word on avocados? 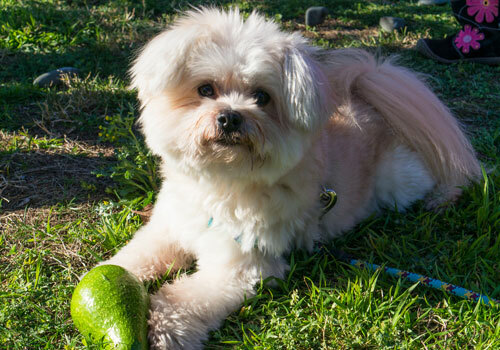 Can dogs eat avocados safely? As this article has shown, avocado can be perfectly safe and healthy for dogs, as long as it’s given in moderation. The tasty fruit is jam-packed with natural fats, proteins, vitamins and fatty acids which help with your pooch’s regular organ and skin development and keep their fur shiny and healthy. As with any other snack, quantities need to be controlled to avoid overeating. Always remove the pits and the peel to avoid choking hazards and an emergency trip to the vet. Finally, keep observing your dog. There’s no one who knows them better than you and you’ll be the best person to notice if they’re behaving oddly after eating avocado. Follow this detailed guide on the relationship between avocado and dogs and you can make sure that your pooch will only ever benefit from the avocados’ amazing taste and healthy nutrients! Can Dogs Eat Broccoli: Raw or Cooked? and How Much Is Too Much!